The LG DoublePlay remains a curious device heading to T-Mobile’s store shelves with its dual-screen approach to multitasking. T-Mobile hopes that the DoublePlay will appeal to individuals who can benefit from having the second screen to constantly stay connected through social media that would otherwise require you to exit the main screen of your smartphone. The DoublePlay packs a 3.5″ primary screen, 2.0″ secondary screen with a Slide-Out QWERTY keyboard, Android 2.3, 4G, 5 megapixel camera, 720p HD video and 1500mAh battery. Look for it November 2nd. If this device was made by HTC or Samsung I would want one.. Too bad its a LG. I have a feeling I know the answer to this question…but FFC?!?!? good concept, but not very nice to look at. it looks like an lg phone…. I think it looks more like a Nokia NGage. It might appeal to those former NGagers. Surprisingly, I know quite a few people who are excited for this phone, while I’m wanting a phone that’s basically the Samsung Galaxy Nexus but actually accepts SD Cards. That omission was pretty stupid. nokia made a few, 6800, 6810, 6820, e-70. I love this site for many of the same reasons most people do, but These half a$$ed photos need to stop! The “blurry cam”, and all the crap done to string us along has no concept….WHY NOT WORK HARDER TO GET A REAL HANDS ON VIDEO, SO WE ALL WOULD FEEL LIKE WE ACTUALLY PREVIEWED SOMETHING. I get the string along aspect, but lets all be real here…..EVERY ITEM SET FOR THE NOVEMBER 2ND STREET DATE ARE ALL AT THE RETAIL STORES RIGHT NOW, and DON’T BE SURPRISED IF ALL OF THESE DEVICES ARE RELEASED THIS WEDNESDAY ON THE 26! I am paying close attention to how things are done on this site and just like the amaze and the gs 2…the release or availability will JUST HAPPEN….USUALLY SEVEN DAYS PRIOR TO THE DATE STATED. Again I think the point of this site is well taken, but tell us what u really know n stop stringing us along. 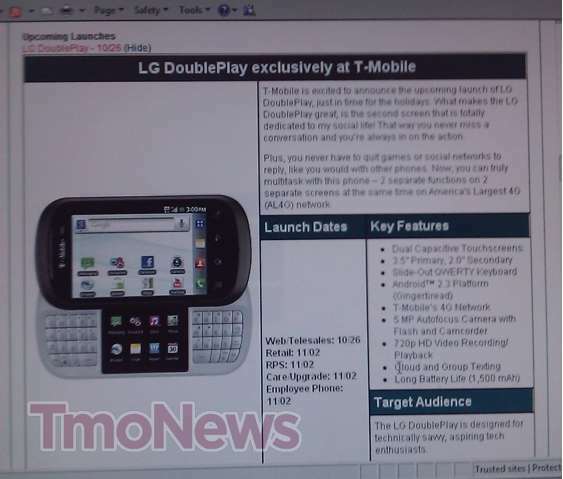 https://www.tmonews.com/2011/10/lg-doubleplay-first-press-shots-uncovered-dual-screens-ahead/Don't be dumb, David don’t like it. He will call you a chipmunk face. TmoNews posts what they can get from their inside ninjas and other news sources. Its not a blog run my T-mobile itself with David being an executive level employee with access to all the phones being released along with the most current road map & release calandar(although I’m sure he wishes he were an executive employee there at T-mobile). He gets little snippits that get passed to him. If he deems the items news worthy and credible, he’ll post the items. Believe me, I’ve submitted a couple of items, one of which was posted and one of which he deemed not news worthy (he kindly let me know why he wasn’t going to post it). Engadget, Gizmodo, etc. all run the same way. If Mr Blurrycam takes a picture of a phone that is rumored to come out in a month, of course the picture is going to get posted. If you have mad Photoshop skills and can sharpen the picture to the point where it looks like the phone is in our own hands, then please contribute. Or better yet, if you have the said phone in your hand, take the pictures yourself and do a crystal clear video walkthrough and send it in. You would make a lot of us happy. I would prefer a small tidbit then nothing at all. Don’t rag on TmoNews for posting “stringing us along”. They are posting every bit of information that they can get. Be grateful for what they are giving us. If you want something set in stone, wait for T-mobile to release their press release with the set release date and the press photos for you to peruse. You’ll be waiting a few more weeks for that information. BTW, TmoNews, I think you guys are doing an excellent job! I’m seeing a lot of your stories getting posted onto Engadget, Phone Arena, etc. instead of the other way around (like it used to be when your site first started). It shows that you guys are getting the scoops before the big tech blogs do. The difficult part of this is that you can’t figure out why these shots are like this and why “real” hands on videos don’t come out. People don’t want to get caught because people like yourself don’t like them. Stop complaining about being able to get ANY information first, it doesn’t matter the form in which it comes. Look, just be patient, okay? If you need an outlet for your infinite wisdom about “how things are done” on blogs, go comment on Engadget about how they have horrible Apple bias and how the half a$$ed blurry cam pictures of the latest gadgets need to stop. Wow people get a clue. This is not a phone for adults. It’s a teen phone. I can s see young kids per teens walking around with this phone. Not every phone is going to be a Steve Jobs killer. Ei Iphone. For thoses of you without a brain. this phone is something like what my nokia 6800 and e-70 were. i used my 6800 and later on my e-70 for over 5 years. as an ANDROID 2.3 device it’s cool. split keyboards rock, they force the users to type with the correct hand.